For the 10th year in a row, volunteers are offering free Thanksgiving dinner to thousands in the District. Hungry people from all over D.C. are filling up one of the cavernous halls at D.C.'s convention center. They've come from senior centers, homeless shelters, or their apartment down the street. The tables are covered in neat white table cloths, and each one has a bouquet of donated flowers. Jesse Johnson just finished a heaping plate full of turkey, sweet potatoes, mashed potatoes, and apple pie. "The food was very good and I thought the dressing was fantastic," says Johnson. Johnson is one of around 5,000 people expected to share in the Annual Feast of Sharing, put on by Safeway. Johnson says she especially likes the camaraderie. "It's a great thing that everybody come out, the fellowship, talk to one another, meet new people" says Johnson. Feeding the area's homeless on Thanksgiving Day. Many people are here for the same reason as Donnell Waynewright. "Cause I'm hungry, cause, you know, I live in the shelter," says Waynewright. Wayneright lost his job and his apartment this year. "I'm just thankful there are people giving back to the community like this," he says. Almost a thousand volunteers are here helping. Some are putting on a job fair downstairs, some are giving free flu shots and some, like 13-year-old Amirah Johnson, are doling out food. "I've been coming since I was four," says Johnson. "Instead of stuffing my face on Thanksgiving, I can help other people eat too." 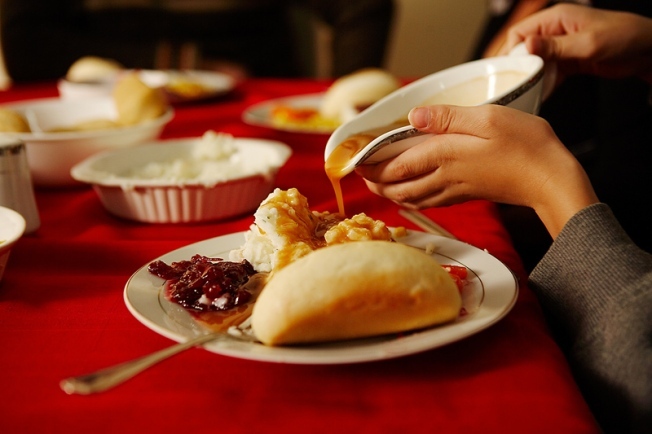 Organizers say last year the Sharing Feast fed a record number of people. This year, they expect even more.